Abstract Training variation is increasingly acknowledged as serving a key function in successful training prescription. It offers a framework for planned and systematic variation of training parameters, in a way that direct physiological adaptations to the training goal required for the sports are achieved. Accordingly, training studies typically find periodized training to elicit improved training responses in comparison to training groups employing constant load throughout the training period. It is an innovative way of preparing athletes for competitions. The art of periodization uses progressive overload, general adaptation and recovery principles, bringing in an element of science and planning into exercise variation. Periodized training offers development of strength, power, body composition and other performance variables. Most sport coaches do not understand how periodization works and it benefits, hence this study. Balsom P, Soderlund K, Ekblom B. (1994), Creatine in humans with special reference to creatine supplementation. Sports Med 18:268–280. Beck TW, Housh TJ, Johnson GO, Coburn JW, Malek MH, Cramer JT,(2007), Effect of a drink containing creatine, amino acids, and protein combined with ten weeks of resistance training on body composition, strength, and anaerobic performance, J Strength Cond Res, 21(1): 100-4. Becque.M.D, Lochmann.J.D, Melrose.D.R, (2000), Effects of oral creatine supplementationon on muscular strength and body composition, Med sci sports exerc; 32(3): 654-658. Bemben.M.G, Bemben.D.A, Lofliss.D.D, Knehans.A.W, (2001),Creatine supplementation during resistance training in college football athlete, Med Sci sports Exerc,33,1667-73. Bird, S. P. (2003), creatine supplementation and exercise performance: a brief review. J Sports SciMed 2, 123-132. Burke L, Pyne LD, Telford R. ( 1996), Effect of oral creatine supplementation on single-effort sprint performance in elite swimmers. Int J Sport Nutr 6:222–233. Burk.D.G,Silver.S,Holt.L.E,Smith.P.T,Culligan.C.J,Chilibeck.P.D,(2000),The effect of continuos low dose creatine supplementation on force ,power, and total work, Int J Sport Nntr ExerciMetab,10(3): 235-440. Cha, K., Chertow, G.M., Gonzalez, J., Lazarus, J.M. and Wilmore, D.W, (1995), Multifrequency bioelectrical impedance estimates the distribution of body water. J Appl Physiol 79, 1316-1319. Chilibeck.P.D, Stride.D, Farthing.J.P,Burke.D.G,(2004), Effect of creatine ingestion after exercise on muscle thickness in male and female, Med sci sports exerc. 36 (10):1781-8. Cooke W, Grandjean PW, Barnes WS. ( 1995), Effect of oral creatine supplementation on power output and fatigue during bicycle ergometry. J Appl Physiol 78:670–73. Cribb P J., Williams A D., Stathis C G, Carey M F, Hayes A,(2007), Effects of Whey Isolate,Creatine, and Resistance Training on Muscle Hypertrophy, Med. Sci. Sports Exerc., Vol. 39,No. 2, pp. 298–307. Earnest C, Snell P, Rodriguez R, Almada AL, Mitchell TL. (1995), The effect of creatine monohydrate ingestion on anaerobic power indices, muscular strength and body composition.Acta Physiol Scand 153:207–209. Ferguson TB, Syrotuik DG, (2006), Effects of creatine monohydrate supplementation on body composition and strength indices in experienced resistance trained woman, J Strength CondRes, 20(4), 939-46. Francaux, M. and Poortmans, J.R. (1999) Effects of training and creatine supplement on musclestrength and body mass. Eur. J. Appl. Physiol Occup Physiol80, 165-168. Harris RC, Viru M, Greenhaff PL, Hultman E. ( 1993), The effect of oral creatine supplementation on running performance during maximal short term exercise in man. J Physiol 467:74. Johnson.S. B,Knopps D.J, Miller.J.J, Gorshe.J.F, Luzinski. C. A, (2006), the effects of creatine monohydrate on 1RM bench press, J. Undergrand. Kin. Res.1(2): 8-14. Kelly VG, Jenkins DG. (1998), Effect of oral creatine supplementation on near-maximal strength and repeated sets of high-intensity bench press exercise. J Strength Cond Res 12:109-115. Koshy KM, Griswold E, Schneeberger EE (1999), Interstitial nephritis in a patient taking creatine[letter].N Engl J Med; 340:814–815. Kutz.M.R, Gunter.M.J, (2003),Creatine supplementation on body weight and percent body fat, J Strenght Cond Res.17(4):817-21. Magali. L,Poortmans.J.R, Francaux. M, et al, (2003), No effect of creatine supplementation on human myofibrillar and sarcoplasmic protein synthesis after resistance exercise, Am J Physiol Endocrinol Metab 285: 1089-1094. NIH (1996) bioelectrical impedance analysis in body composition measurement: National Institutes of Health Technology Assessment Conference Statement. Am. J. Clin.Nutr 64, 524-532. Park. H S, Sim S J, Park J Y (2004) Effect of Weight Reduction on Metabolic Syndrome in Korean Obese Patients J Korean Med Sci; 19: 202-8. Peeters BM, Lantz CD, Mayhew JL (1996), Effect of oral creatine monohydrate and creatine phosphate supplementation on maximal strength indices, body composition, and blood pressure. J Strength Cond 4(3):1–2. Pritchard NR, Kalra PA (1998), renal dysfunction accompanying oral creatine supplements .Lancet; 351:1252–1253. Poortmans JR, Auquier H, Renaut V,et al(1997),Effect of short-term creatine supplementation on renal responses in men .EurJApplPhysiol;76:566–567. Poortmans JR, Francaux M (1999), Long-term oral creatine supplementation does not impair renal function in healthy athletes. Med Sci Sports Exerc; 31:1108–1110. Powers. M.E, Arnold. B. L, Weltman. A. L, Perrin. D.H, Mistry. D, Kahler. D.M, Kraemer W, Volek. J, (2003), Creatine supplementation increases total body water without alerting fluid distribution, J of Athletic Training, 38(1): 44-50. Rawson.E.S,Volek.J.S,(2003),Effects of creatine supplementation and resistance training on muscle strength and weightlifting performance, J Strenght Cond Res, 17 (4):822-31. Salmi. A. J,(2003), Body composition assessment with segmental multifrequency bioimpedance method, J Sport Sci & Med, Suppl.3. Sartorio. A, Malavolti. M, Agosti1. F, Marinone1. PG, Caiti O, Battistini N and Bedogni. G (2004), Body water distribution in severe obesity and its assessment from eight-polar bioelectrical impedance analysis. Euro. J. Clin.Nutr, 1–6. Schulte JN, Noreen EE, Bachman LD, Nieminen TJ, Lemon PWR. (1999), Creatine or protein + creatine supplementation enhances strength gains with heavy resistance training. Can J Appl Physiol 24:477. Syrotuik, D.G., et al (2000) Absolute and Relative Strength Performance Following Creatine Monohydrate Supplementation Combined with Periodized Resistance Training. J Strength Cond Res 14(2): 182-190. Willoughby, D.S. and Rosene, J. (2001). Effects of oral creatine and resistance training on myosin heavy chain expression. Med. Sci. Sports Exerc 33, 1674-1681. Young, R. B. and Denome, R. M. (1984) Effect of creatine on contents of myosin heavy chain and myosin-heavychain mRNA in steady-state chicken muscle-cell cultures. Biochem. J. 218,871±876. ISNAD ALAYODE, AJIBUA , GARBA, YAKASAI . "PERIODIZATION: A TRAINING SCIENCE FOR PEAK PERFORMANCE IN SPORT". 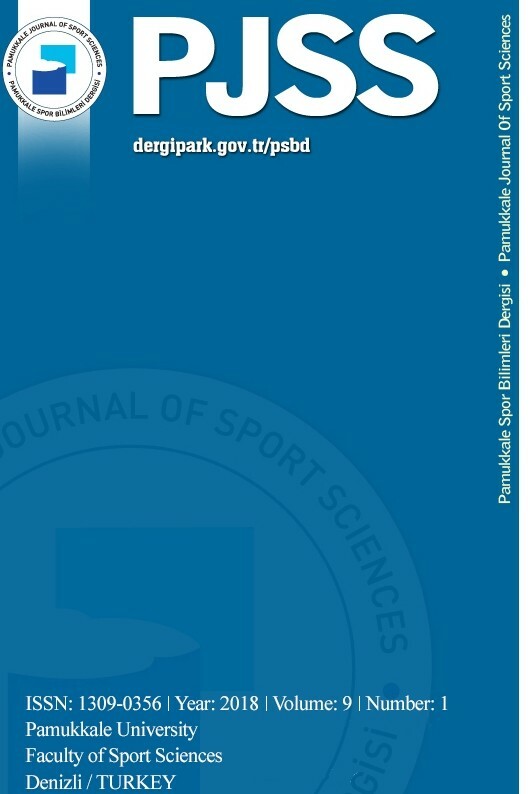 Pamukkale Journal of Sport Sciences 5 / 2 (May 2014): 60-74.